On Halloween in 2008, about six weeks after Lehman Brothers collapsed, my mother called me from Michigan to tell me that my father had lost his job in the sales department of Visteon, an auto parts supplier for Ford. Two months later, my mother lost her job working for the city of Troy, a suburb about half an hour from Detroit. From there our lives seemed to accelerate, the terrible events compounding fast enough to elude immediate understanding. By June, my parents, unable to find any work in the state where they spent their entire lives, moved to New York, where my sister and I were both in school. A month later, the mortgage on my childhood home went into default. After several months of unemployment, my mother got a job in New York City, fundraising for a children’s choir. In the summer of 2010, I completed my studies at New York University, where I received a BA and an MA in English literature, with more than $100,000 of debt, for which my father was a guarantor. My father was still unemployed and my mother had been diagnosed with an aggressive form of breast cancer. She continued working, though her employer was clearly perturbed that she would have to take off every Friday for chemotherapy. To compensate for the lost time, on Mondays she rode early buses into the city from the Bronx, where, after months of harrowing uncertainty, my parents had settled. She wanted to be in the office first thing. Now 30, I have been incapacitated by debt for a decade. The delicate balancing act that my family and I perform in order to make a payment each month has become the organising principle of our lives. I am just one of44 million borrowers in the US who owe a total of more than $1.4 trillion in student loan debt. This number is almost incomprehensibly high, and yet it continues to increase, with no sign of stopping. Legislation that might help families in financial hardship has failed in Congress. A bill introduced in May 2017, the Discharge Student Loans in Bankruptcy Act, which would undo changes made to the bankruptcy code in the early 2000s, stalled in committee. 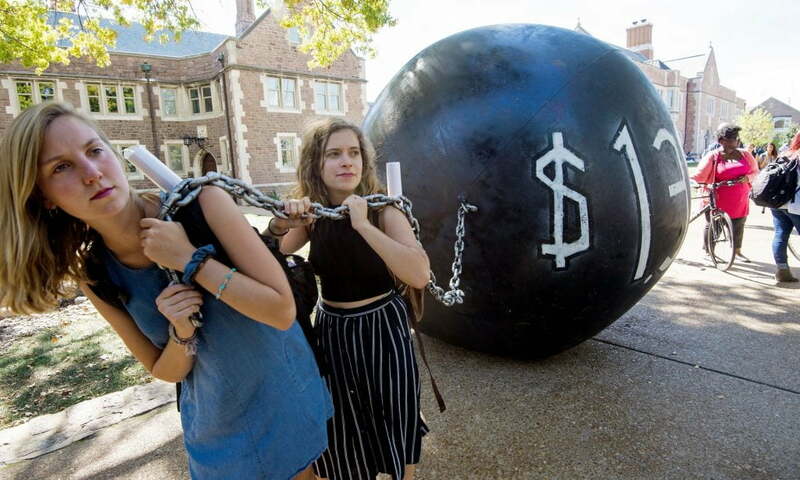 Despite all evidence that student loan debt is a national crisis, the majority of the US government – the only organisation with the power to resolve the problem – refuses to acknowledge its severity. After the dust settled on the collapse of the economy, on my family’s lives, we found ourselves in an impossible situation: we owed more each month than we could collectively pay. And so we wrote letters to Citibank’s mysterious PO box address in Sioux Falls, South Dakota, begging for help, letters that I doubt ever met a human being. We grew to accept Citibank as a detestable Molochthat we feared and hated, but were made to worship. The letters began to comprise a diary for my father in particular, a way to communicate a private anguish that he mostly bottled up, as if he was storing it for later. In one letter, addressed “Dear Citi,” he pleaded for a longer-term plan with lower monthly payments. He described how my mother’s mounting medical bills, as well as Chase Bank’s collection on our foreclosed home, had forced the family into bankruptcy, which provided no protection in the case of private student loans. We were not asking, in the end, for relief or forgiveness, but merely to pay them an amount we could still barely afford. “This is an appeal to Citi asking you to work with us on this loan,” he wrote to no one at all. Crowley’s office wrote back. It was the first time in about two years that a person had responded to our correspondence with encouragement, or something like it. Someone who worked for his office in Washingtonhelped to arrange a conference call with government liaisons from Citigroup to discuss a different payment plan. The monthly payments to Citi were then more than $800 a month, and we were trying to talk them into letting us pay the loan over a longer period, at a rate of about $400 a month. These terms were reasonable enough, but the response to this request was like an automated message brought to life: “We are precluded from a regulatory perspective from being able to do what you are asking,” each of the representatives said. What made these exchanges more ridiculous was the fact that Citibank was in the process of retreating from the student loan market by selling off my debt to Discover Financial, who would give us the same response. We were nothing to these companies but a number in a database. And they fully controlled our fates. Iused to wonder if the people who worked for these lenders had families of their own, and if they would ever find themselves bankrupt, wondering where they were going to live. Most of all, I wondered what they would do if their own children had to take out loans to pay for college. After 10 years of living with the fallout of my own decisions about my education, I have come to think of my debt as like an alcoholic relative from whom I am estranged, but who shows up to ruin happy occasions. But when I first got out of school and the reality of how much money I owed finally struck me, the debt was more of a constant and explicit preoccupation, a matter of life and death. In the same situation with the college loan, I owe more now than when I first started paying it back 5 years ago. I thought Obama passed a law that you only have to pay on them for 20 years and that’s what I’m probably looking at as my way of escape! Hang in there you are not alone! I feel for you & your family. I am very sorry to hear of your plight. It may seem a long way off, but you should get some respite when the Event occurs.